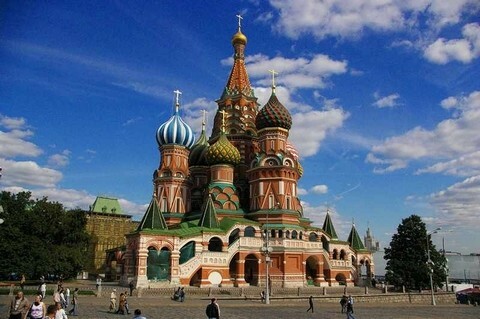 There is the Russian Orthodox Church in Moscow and the number of cathedrals is much more than that in other countries. There are not only the president's office but also two cathedrals called Uspenskiy sobor and Cathedral of the Annunciation in the Kremlin that we often hear in news. Also, there are really many chathedrals and churches around Kremlin, so that it seems impossible to introduce all of them here. The especially famous one among them is Pokrovsky Cathedral (The Cathedral of Vasily the Blessed). It is famous because of its appearance. It is a fancy building with exotic color, and the dome part is a unique shape like a whipped cream. When the emperor at the time saw this building, he praised it saying that he would never see such a beautiful building again. The Cathedral of Christ the Saviour blown up by Stalin was restored after the restoration was completed in 2000 and its exterior and interior faithfully reflect the former building. It is common for the Russian cathedrals to have a dome shaped like a whipped cream. While a one-dome arrangement represents Christ, a five-dome configuration represents Jesus and the four Gospel writers. Thus, the number of domes carries significance. It must be interesting to walk in Moscow, paying attention to that point and comparing the number of domes of the cathedrals.